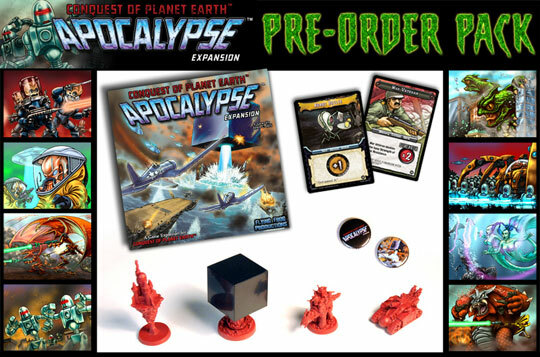 The Apocalypse Expansion for Conquest of Planet Earth sees the battle for Earth continue, escalating in scale as more Alien species are dispatched to the planet to take on the growing resistance of the stubborn Human defenders. 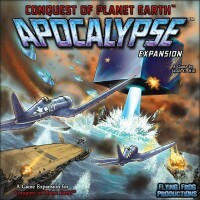 Including several new Alien races to play (such as the fearsome Selenian Sirens, or the Martian Confederacy with their pack tactics), a new deck of Coastal Resistance for the Humans (filled with battleships, submarines, and navy Jet Fighters), and the awesome power of the dreaded Apocalypse Cube™, emissary of Armageddon. Apocalypse also adds new cards to all of the original decks and includes more saucers and boards to expand the player count up to 5-6 players. Flying Frog Productions’ “Conquest of Planet Earth: Apocalypse” does everything a good game expansion should do: include additional content and introduce a few new mechanics. The original game was largely centered around dealing with the Humans’ ground-based forces, but as suggested in the box art, human naval power joins the fray this time around. This is represented in the new “Naval Resistance” deck, which scales in difficulty from Marine infantry to aircraft carriers and even includes a variant of the infamous Captain Fantastic superhero card. The naval deck even includes its own heroes, which aid the human resistance and generally make life worse for the player aliens. A few of the beefier naval resistance are further represented by tokens which force players to battle them twice but count as trophies once they are defeated. It remains to be seen how the additional content affects game balance in a relatively unbalanced game. All the additions in “Apocalypse” serve to make an already great game even better; a definite must-buy for fans of the base game. Add a Review for "Conquest of Planet Earth: Apocalypse"